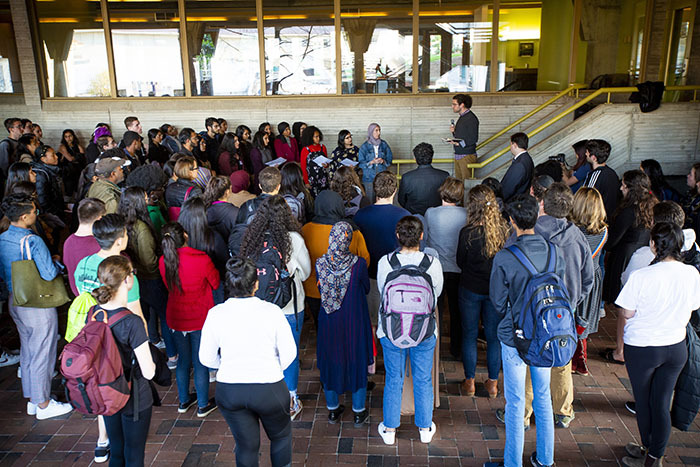 Emory students, faculty and staff gathered March 20 to honor those killed in attacks on two mosques in New Zealand and to show support for the Muslim community and all who have been victims of violence. 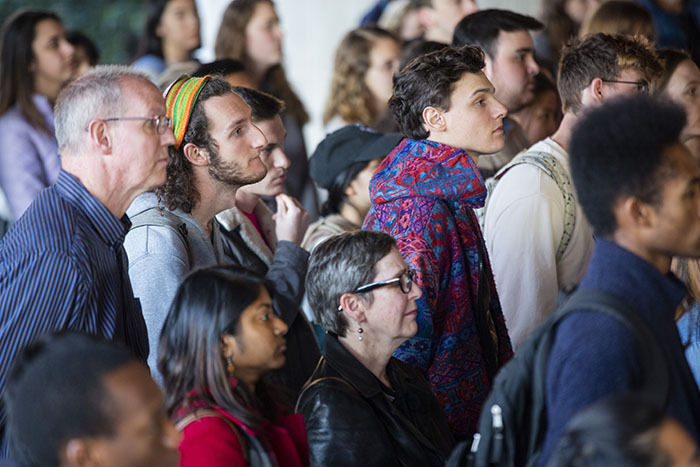 Emory students, faculty and staff gathered Wednesday, March 20, to honor those killed and injured in the attacks on two mosques in New Zealand, sharing reflections, prayers and messages of support for the Muslim community and all who have been victims of violence and hate. 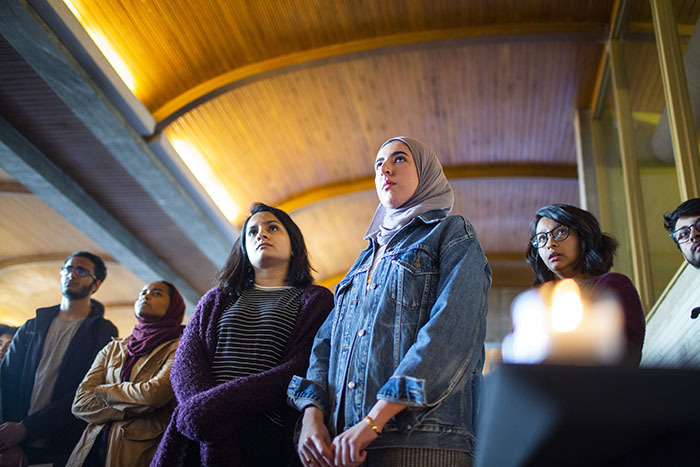 The vigil, held in the covered area behind Cannon Chapel, was organized by Emory’s Muslim Students Association and the Office of Spiritual and Religious Life. 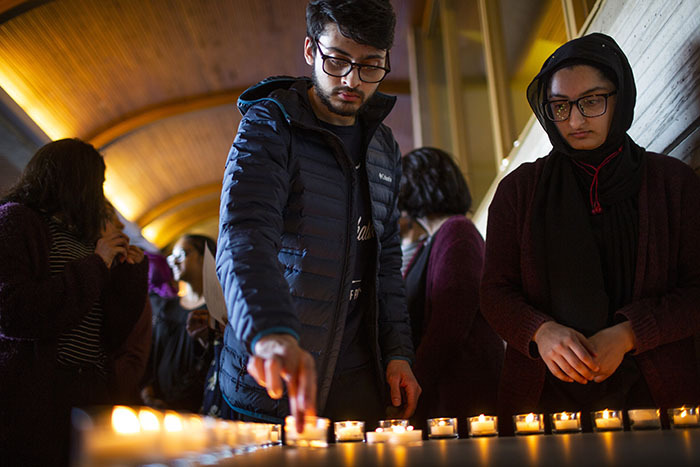 As students read the names of the 50 people killed in New Zealand, they lit candles for each, which formed a poignant line along the window ledge, then filled a table with glowing light. 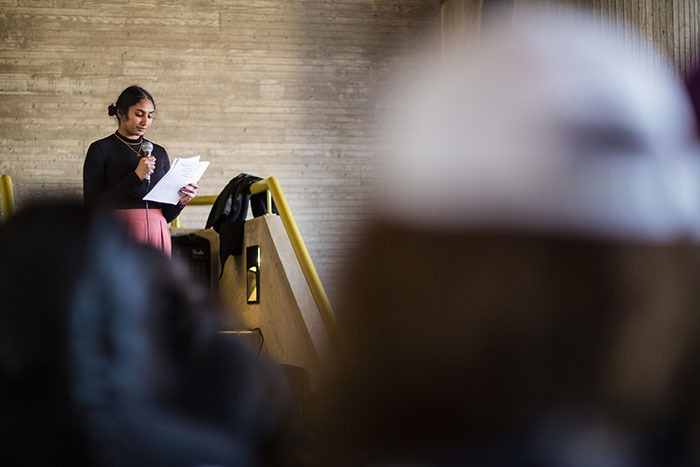 One after another, student speakers offered messages of resilience and hope, mourning those killed while vowing to remain strong in their faith and to come together across differences. 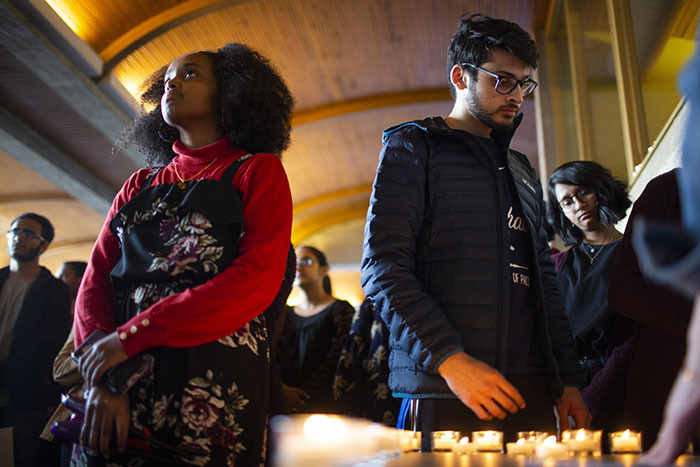 Several noted that this was not the first time that the Emory community had united in mourning for victims of hate-fueled attacks, including a vigil in the same location last semester for those killed at a synagogue in Pittsburgh. 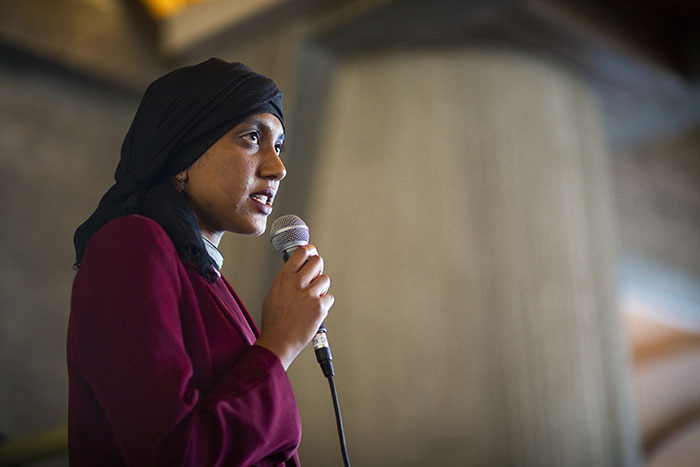 Lisa Garvin, acting dean of the chapel and spiritual life, introduced a series of interfaith prayers from students representing Muslim, Jewish, Hindu, Buddhist and Christian traditions. 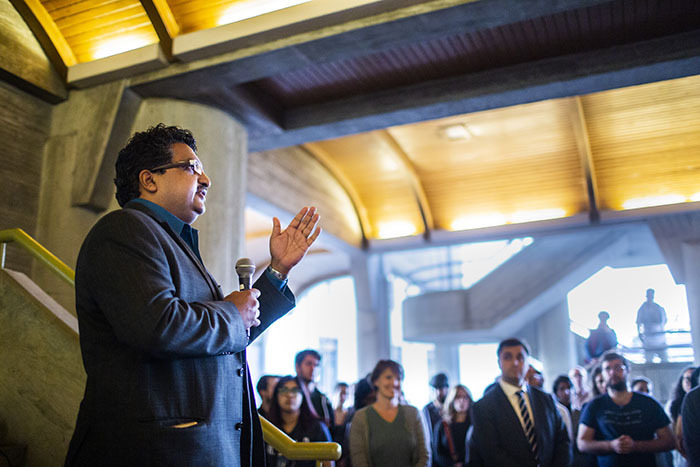 As the sun began to set, Isam Vaid, Emory’s religious life scholar for the Muslim faith, gave the call for the Muslim “maghrib” or sunset prayer. Those who wanted to pray then gathered in Cannon Chapel, where there was additional time to share feelings and thoughts about the New Zealand attacks. Emory Helpline is an anonymous, peer counseling telephone service for students. It is open from 8:30 p.m. to 1 a.m., seven days a week, during the regular academic year (excluding major holidays). Students with non-urgent mental health situations may contact the Helpline at 404-727-4357 (HELP). 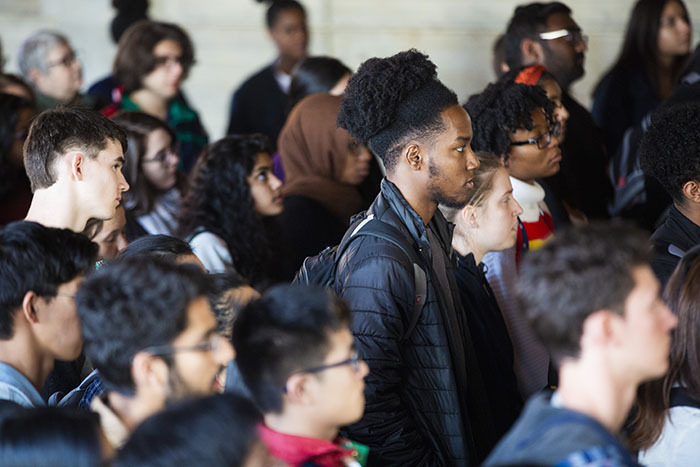 Counseling and Psychological Services (CAPS) provides individual, group and couples counseling; stress management classes; and community outreach to provide support for students and assist them in negotiating emotional and interpersonal difficulties as they matriculate through Emory University. 404-727-7450. Student Intervention Services (SIS) assists students in times of crisis. It also offers impartial, judgment-free counsel for students seeking guidance and assistance through life's ongoing challenges. 404-430-1120. Student Health Services (SHS) offers free psychiatric services for all enrolled Emory students. Services include diagnostic psychiatric evaluations, medication evaluations, long-term management of psychiatric medications, and community referrals. Learn more information about reaching SHS after-hours emergencies or call 404-727-7551. Office of Spiritual and Religious Life is located in the Alumni Memorial University Center (AMUC 125) and Cannon Chapel (Suite 316). Services are available for students, faculty and staff. 404-727-6225. Faculty Staff Assistance Program (FSAP) provides support for employees, including daytime emergency appointments and on-call after-hours services. Visit the emergency services webpage or call 404-727-9355 (WELL).